…shall stop my husband from grilling in our Faribault backyard. On the menu: Chicken breasts, baby red potatoes and asparagus. TELL ME: Would you grill in these conditions or worse? Let’s hear. Photographed in downtown Faribault at 1:30 p.m.
ON DAYS LIKE TODAY, when the windchill plummets to double digits below zero, I have to question the sanity of living in Minnesota. It’s bitterly cold here. 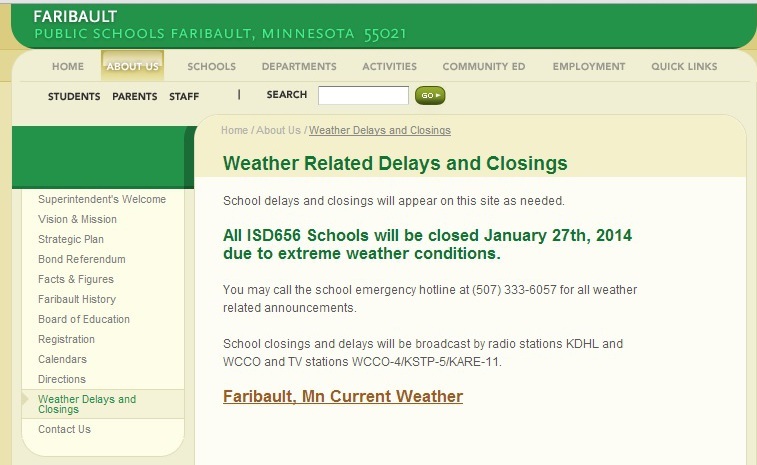 Like 23 degrees below zero in Faribault at 7:30 this morning. The temp mid-afternoon has now reached a balmy minus six degrees. And, yes, 17 degrees make a difference, especially when in the below zero Fahrenheit range. The sun shines bright against the snow. And if not for the frost edging windows, the sound of car tires crunching on snow as traffic passes my home, the steady thrum of the furnace, the fleece throw warming my lap, I might convince myself that it’s not really that bad outside. But then I remember the biting cold, the sparse church attendance, the icy car seat, the unattended vehicles warming in parking lots, the state-wide average windchill of minus 35 degrees. This is reality today in Minnesota. It’s cold. Really cold. AFTER LIVING IN MINNESOTA my entire life, I’m still learning how to best handle these sometimes brutal winters. I’m not talking big stuff here. But the little stuff that, on a daily basis, can prove bothersome. Take skin. Dry winter air and cold tend to dry out skin, causing itchiness. About six weeks ago, I was dealing with a break-out (no, not pimples) on my face and elsewhere caused by, I suspect, stress and the changing climate. That’s when I experienced an ah-ha moment. Consider switching soap brands and washing my face less often. Now you would think this easy. But for someone who has used Dial soap her entire life because that’s what she grew up with, this seemed almost traitorous. I know. Sounds silly. But I have fond memories of Aunt Dorothy soaping my feet with a Dial lathered washcloth in Grandpa’s pink tiled bathroom. We had no bathroom at home and bathed in a galvanized tub heaved onto the red-and-white checked kitchen linoleum tile every Saturday night. Bathing in a real bathtub in an authentic bathroom impressed upon my memory. I pushed aside those gold bar memories and purchased a moisturizing soap. Guess what? It’s helped. Why did it take me decades to figure this out? Brand loyalty blinded me. 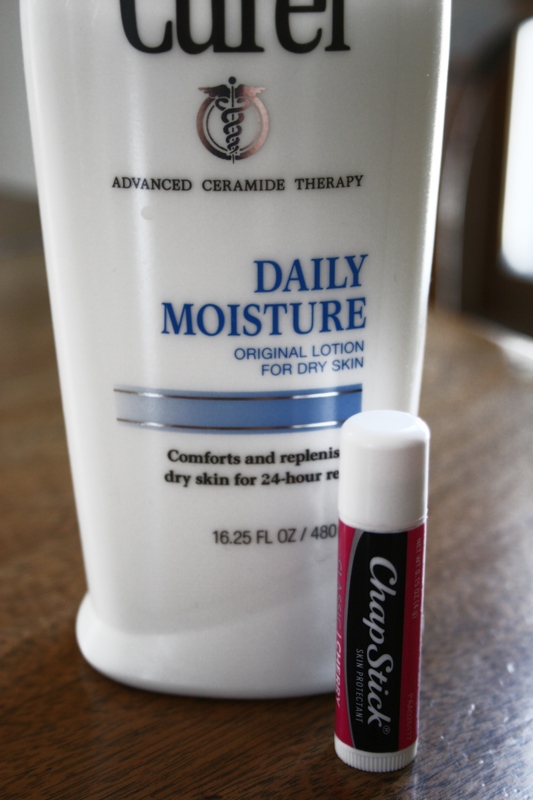 Winter necessities: lotion and ChapStick. Other moisturizers, like ChapStick and lotion, remain staples in my winter arsenal. I had no problem ditching the gel-like Corn Huskers lotion of my youth. It never worked on youthful hands cracked and bleeding from mixing milk replacer in buckets of steaming hot water and then not drying them properly before venturing to the calf barn. 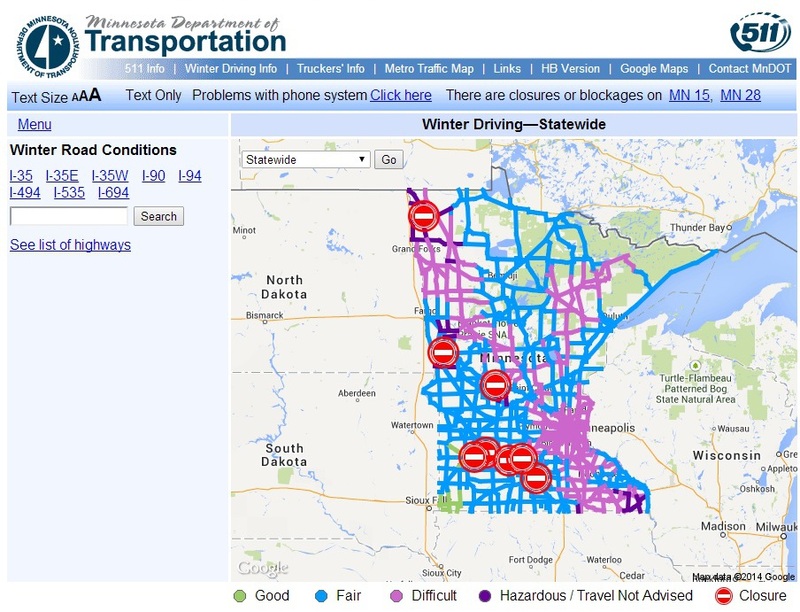 Staying warm in a Minnesota winter, especially during this recent cold snap, can also be challenging. I live in an old house, which chills down, requiring creative ways to add warmth without cranking up the thermostat. Warm throws top corralled magazines in my living room. Thick flannel sheets replaced summer-weight cotton in November. 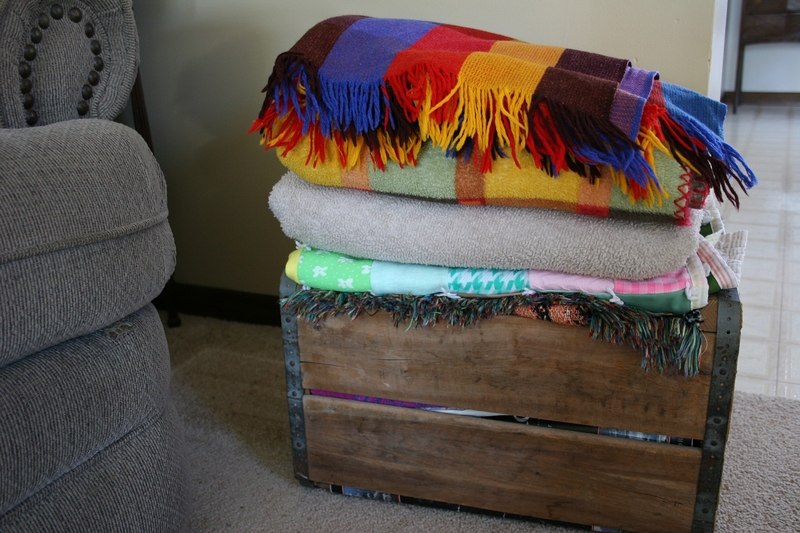 Fleece and wool throws fill a box next to the sofa and are tossed onto laps on chilly evenings or during the day when I’m writing in my home office. 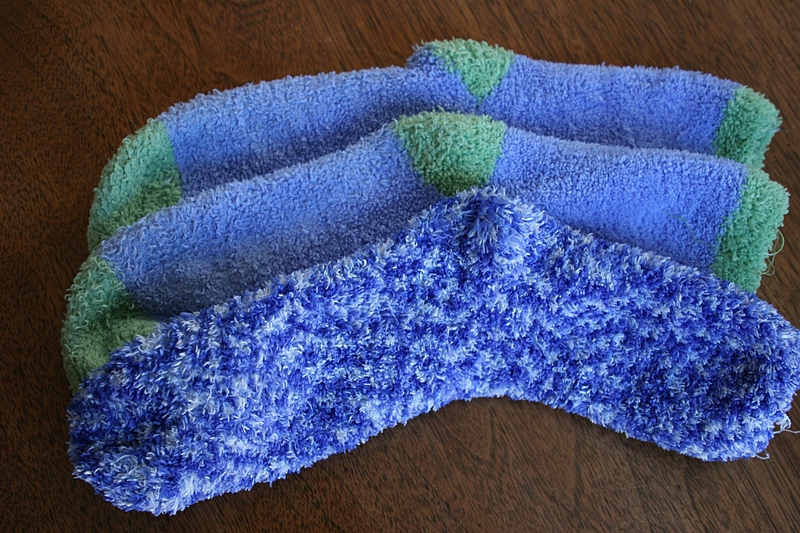 Fuzzy slipper socks keep my feet warm. Just this year I determined that slipper socks slipped over regular socks keep my whole body warmer. I do layers. Sweatshirt or sweater over flannel shirt, fashion be damned. But there’s one problem I haven’t resolved. On frigid mornings like those this week with outdoor temps dipping into single and double digits below zero degrees Fahrenheit, I wake up with a profound headache. My back and neck muscles clamp around bone. Achy. Tight. It feels as if I have clenched my teeth all night and perhaps I have. A soothing hot shower and two Ibuprofen usually resolve the situation. But I’d rather prevent the problem. What’s the cause and what’s the solution? Wearing a stocking cap to bed? 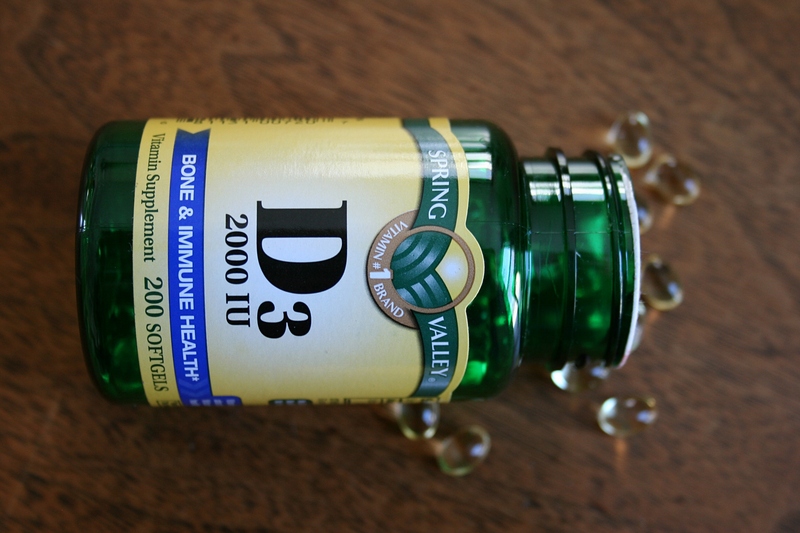 Given the shortage of sunshine during our long Minnesota winters, vitamin D was suggested by my doctor. Yes, I’m low on the vitamin, as most Minnesotans likely are. IF YOU LIVE IN A COLD WEATHER state like Minnesota, how do you stay warm during the winter, deal with skin issues and more? I’d like to hear. TODAY APPEARED deceptively lovely. Blue sky. Sunshine. Fresh layer of snow overnight. 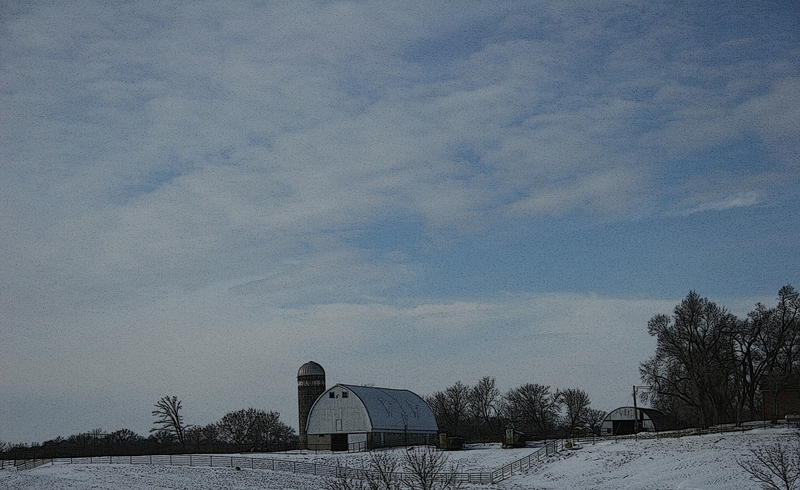 A rural scene along Interstate 35 north of the Northfield, Minnesota, exit. But appearance is not reality. 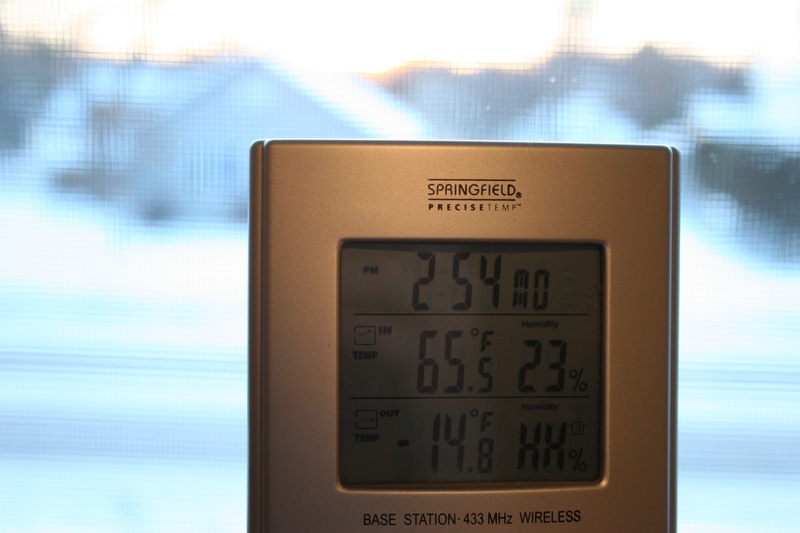 On this Sunday in Southern Minnesota, the temp dipped to minus two degrees Fahrenheit by late afternoon. 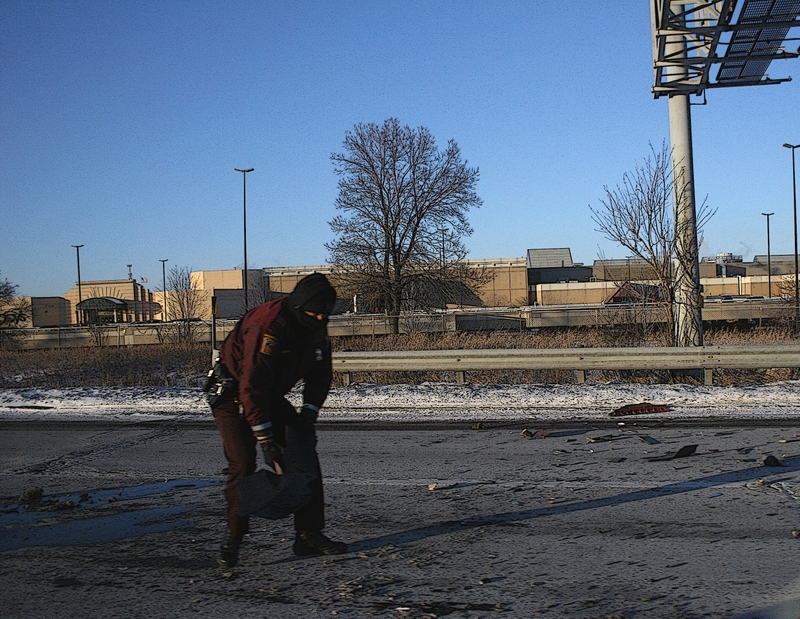 A tough job on a cold day, cleaning up after a crash. Steam hangs heavy in the air during cold spells. 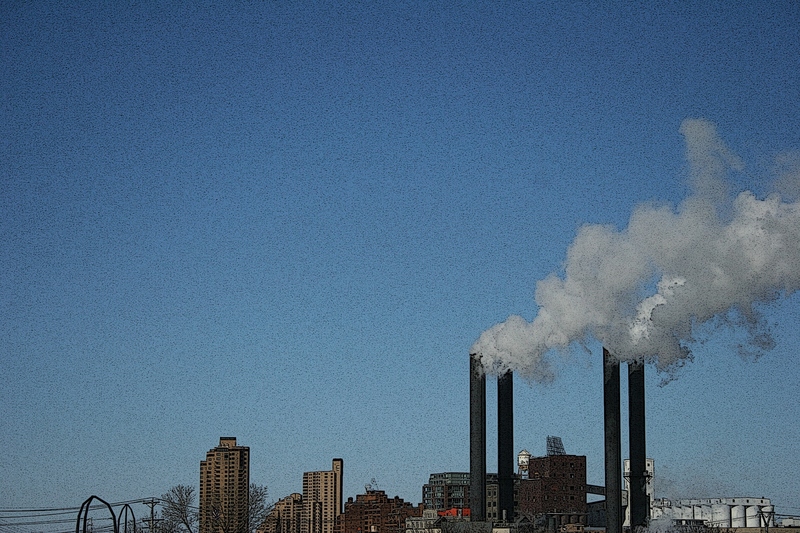 Near downtown Minneapolis, smokestacks billowed steam, always more prominent on days like today. 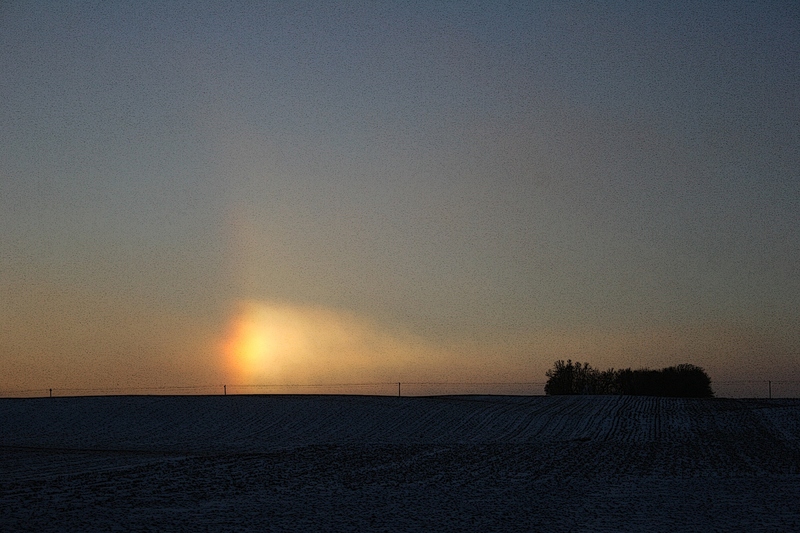 A sun dog photographed from Interstate 35 between the Northfield and Faribault exits. As day shifted to evening, sun dogs showed up, bright columns of light flanking the sun. Another sun dog, photographed just before the first Interstate 35 exit southbound into Faribault. 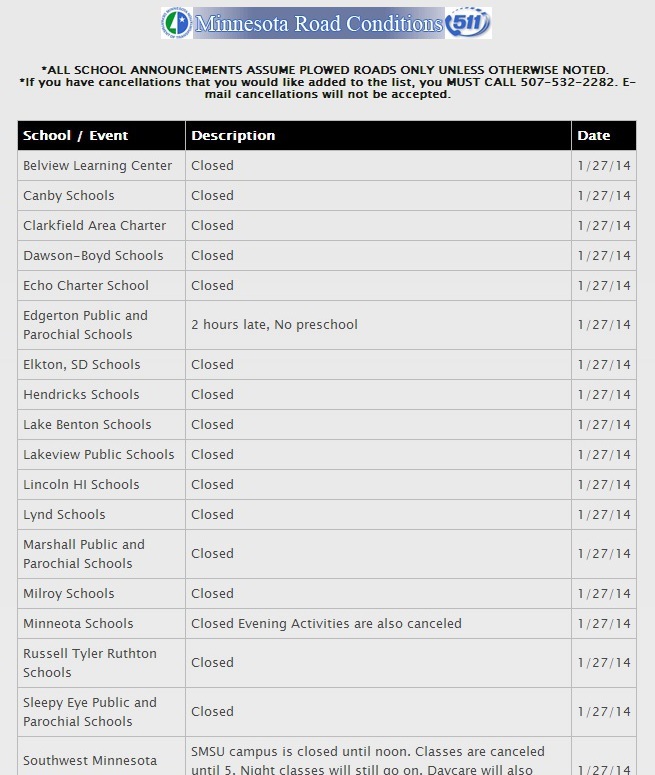 It’s been one cold day in Minnesota.